It is quite a bold statement to make, but Romelu Lukaku is simply the best striker in the Premier League. His strike rate in unrivaled among his peers, with not a single player in last seasons top 10 goal scorers able to match his phenomenal ratio of goals per minutes on the pitch. At 0.76 goals per 90 minutes he stands way out in front of a raft of World class strikers including, Van Persie, Suarez and Aguero. 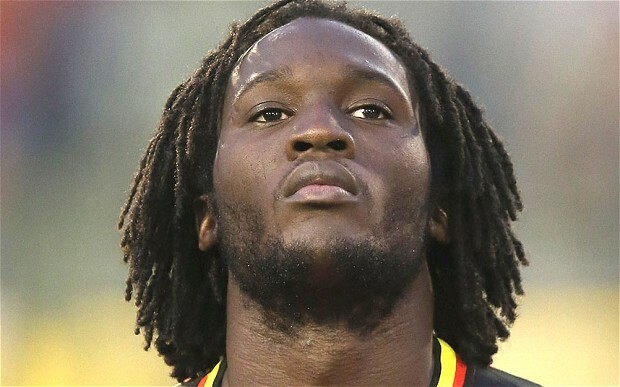 It is therefore with great excitement that Evertonians await the debut of their new centre forward Romelu Lukaku. The Belgium sensation has been forced to wait three weeks for his Everton debut and is relishing the opportunity to make his first appearance for the Blues in the weekend trip to West Ham. Lukaku enjoyed a fabulous year at West Brom last season, with his 17 goal return propelling the Baggies from mid table mediocrity to European challenges for much of the season. His absence from the Hawthorns has impacted severely on Steve Clarke’s team, with West Brom yet to win a Premier League game and only scoring one goal in their opening four matches. Everton will be hoping his arrival at Goodison will lift the Blues from sixth place to Champions League contenders. Roberto Martinez has struggled to hide his delight since securing Lukaku’s signature in a season long loan deal from Chelsea. Speaking to evertonTV ahead of his debut, Martinez expects an instant impact from the giant Striker. Everton will be looking for Lukaku to bring a genuine cutting edge to the Blues attack. His return of 17 goals almost came at a rate of a goal every two games. What makes that statistic even more impressive is that he only completed 90 minutes on 7 occasions, starting just 20 games throughout the whole season. Although predominantly left footed, Lukaku’s ability to score with either foot make him an extremely dangerous opponent. 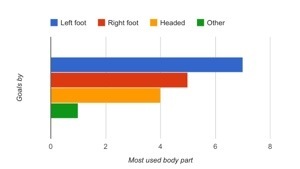 The graph below details the breakdown of his 17 league goals for West Brom, with a fairly even spread between his head and both feet. Lukaku is undoubtedly one of the greatest striking talents to emerge from Belgium. He is a direct goal threat from anywhere within 25 yards of goal. A natural poacher and penalty box finisher, Lukaku possesses power and strength and is equally dangerous from outside the penalty area as demonstrated by the graphic below. Even at just twenty years of age, Lukaku has an unbreakable confidence, which has enabled him to bounce back from disappointments in his career. He has not let his failure to break into the Chelsea team affect him and if anything, his absence from Stamford Bridge has seen his reputation increase, especially with Chelsea’s mega money strikers struggling for form. He is certainly not daunted by taking on English football’s major teams, scoring goals twice against Liverpool and a hat-trick against Champions Manchester United. It is not just the Evertonians and Martinez delighted by the capture of Lukaku. The 6ft 3inch striker has spoken passionately about the opportunity to represent Everton as simply one he could not turn down. “I came here, because it’s a team that is dominating a lot and Roberto Martinez is a coach who likes possession of the ball. “I think he’s a manager at this stage in my career who can help me. “Personally, I just want to help the team finish as high as possible in the league and hopefully arrive in a cup final if possible. There is an outside opportunity for Everton to sign Lukaku on a permanent transfer, a move that Lukaku would consider if he fails to convince Chelsea of his worth. It is hard to understand why the Pensioners have let Lukaku out on loan, especially considering their miss-firing forwards, but Chelsea’s loss is very much Everton’s gain. Lukaku is the best in the Premier League and from this Saturday forward, he will be wearing Everton blue. He is a very good striker,imagine a striker that scored 17 goals last season,followed by 5 goals during pre-season,I don’t really know what Chelsea are expecting him to prove again. Loaning Lukaku out is a very big mistake.